One of my goals over the past year has been to improve my inversion practice in a safe and sustainable way. Happy to say that by defining this goal and believing in its attainability, here I am! 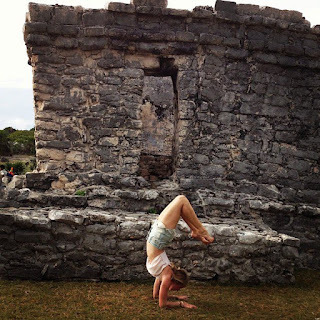 :) Scorpion-style in the Mayan ruins of Tulum, Mexico! Some of the best advice I ever received is to articulate your goals in three ways. In doing this, you will have a more stream-lined idea of what you are aiming to achieve and therefore, will have more liklihood of actually achieving it. Start making your goals more concise, work your booty off and finally, one day, you will SMILE and celebrate their fruition!